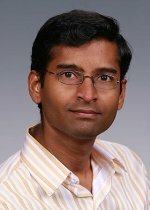 Sriram Krishnamoorthy, a computational scientist at the Department of Energy’s Pacific Northwest National Laboratory, is a member of the FOX research team that has been awarded 10 million core hours on the Intrepid supercomputer at the Argonne Leadership Class Facility. The allotment was awarded through INCITE, a DOE Office of Science program that allocates time on the agency’s leadership-class systems to enable high-impact, grand-challenge research that could not otherwise be performed. The FOX research project is funded by the DOE Office of Advanced Scientific Computing Research and focuses on designing task-based programming models for dynamic load balancing and fault tolerance. The team, led by principal investigator Ron Minnich of Sandia National Laboratories, submitted a proposal requesting an INCITE allotment to develop and test applications and future operating systems for exascale machines.